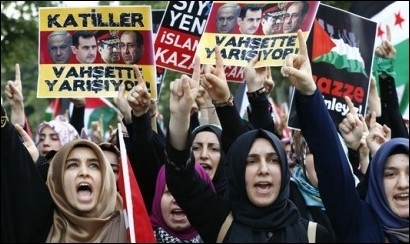 Erdogan has long openly encouraged mass anti-Israel protests in Turkey, like this one in Istanbul, 2014. ... Turkey is normalizing its relations with Israel -- in theory, at least. Ankara and Jerusalem agreed to appoint ambassadors to each other's country after an absence of more than six years. Two prominent career diplomats, Kemal Okem and Eitan Na'eh, will struggle to improve ties in Tel Aviv and Ankara, respectively. They will have a hard job. The diplomats may be willing, but with Erdogan's persistent Islamist ideological pursuits, they would seem to have only a slim chance of succeeding. Turkey's dwindling Jewish community is uneasy over increasing signs of anti-Semitism in an increasingly Islamized country. In Istanbul, where a majority of Turkey's 17,000 Jews live, unknown people recently started hanging posters in a posh district. The posters call on Muslims "not to be fooled by the missionary activities of Jew-servant Jehovah's Witnesses." They say: "These people are trying to destroy the religion of Islam." Signed: Sons of Ottomans. Feeling unsafe, more than 2,500 Turkish Jews have recently applied for Spanish citizenship, and hundreds applied for Portuguese citizenship. Only last year, 250 Turkish Jews emigrated to Israel. That being the case, Islamist Turks are warning their fellow Muslims against missionary activities of Jehovah's Witnesses who are, according to them, "servants of Jews." Erdogan's visceral hostility to Israel and ideological affinity for Hamas have not disappeared. This is not surprising. Erdogan has pragmatically agreed to shake hands with Israel, but his ideological hostility to the Jewish state and his ideological love affair with Hamas have not disappeared. Only a week after Turkey and Israel officially resumed full diplomatic relations, in an interview with Israel's Channel 2 television, Erdogan refused to back down from his earlier comments equating Israel's military action in Gaza in 2014 to Hitler's atrocities. Erdogan said: "I don't agree with what Hitler did and I don't agree with what Israel did in Gaza." Erdogan thinks that Israel's military action in response to Hamas's rockets indiscriminately targeting Israeli citizens is no different than the murder of six million Jews by a lunatic. "There is no point in comparing and asking who is more barbaric," Erdogan concluded. In other words, Erdogan thinks that Hitler and the Israel Defense Forces are "equally barbaric." Left: Erdogan shakes hands with then Israeli Prime Minister Ariel Sharon, May 2005. 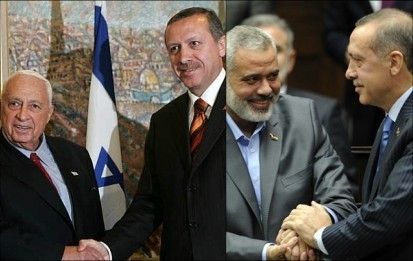 Right: Erdogan shakes hands with Hamas leader Ismail Haniyeh, January 2012. What else? Erdogan said that he is in constant contact with Hamas officials and that he does not believe Hamas is a terrorist organization. What, then is Hamas? According to Erdogan, Hamas is a "political movement born from the national resurrection." During the interview, Erdogan was asked if he was aware of the shock his reference to Hitler caused among Jews. He replied: "I'm very well aware ... But is the Jewish community aware of what is done (in Gaza)?" Much of Erdogan's hostile sentiment over Israel is religious. So is his admiration of Hamas. There is a point of irony, too, in this equation. The total amount of humanitarian aid Turkey has ever sent to Gaza is worth about half of the value of goods, measured at about 400 trucks, that Israel sends to Gaza each and every day. In other remarks, Erdogan accused Israel of restricting Muslim worship. He called on all Muslims to embrace the "Palestinian cause and protect Jerusalem" -- which he seems to think is a Muslim city. Yes, blessed are the peacemakers. Nevertheless, the Turkish-Israeli "peace" will not be easy to sustain.